Leeds and England footballer Jonathan Woodgate has escaped a custodial sentence after being found guilty of affray during an attack on a student in Leeds. The player was instead sentenced to 100 hours' community service after the verdict was delivered at Hull Crown Court. He and his club teammate and fellow international Lee Bowyer were cleared of causing grievous bodily harm with intent. Mr Bowyer was also cleared of affray. But Woodgate's friend Paul Clifford was jailed for six years for grievous bodily harm and affray. Another friend, Neale Caveney, was also ordered to do 100 hours community punishment after he was found guilty of affray but cleared of causing grievous bodily harm. A spokesman for the family of victim Sarfraz Najeib said the verdicts were a "tremendous disappointment". Outside court, Woodgate said through his solicitor that he had "every sympathy" with the Najeib family, but wished to put this episode behind him and continue with his footballing career. Mr Najeib, 21, from Rotherham, South Yorkshire, was beaten unconscious in the attack outside a Leeds club in January 2000. He was bitten on the face and suffered a broken leg, nose and cheekbone. Speaking at a press conference after the case, Suresh Grover, on behalf of the Najeib family, said the family and its supporters were "angry and furious" that only one person was convicted of the "savage and racist attack". Mr Bowyer also spoke only briefly to reporters, to thank his friends, family, legal team, supporters and bosses at Leeds United for "sticking by me". He declined to answer journalists' questions on the future of his football career. Leeds United chairman Peter Ridsdale later told a news conference that both Woodgate and Mr Bowyer would be allowed to continue playing for the club. 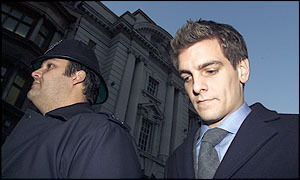 He said the fact that Woodgate had been found guilty of affray was not being taken lightly, and the player would have to face some form of internal disciplinary action. Mr Ridsdale stressed the football club itself had not been on trial, but it would take "some time to repair the damage" as a result of the case. He added: "I have always on the record acknowledged that a crime took place and give my sympathies to Sarfraz Najeib." The jury delivered their verdicts after more than 22 hours of deliberation following a trial lasting nine weeks. The defendants had denied all the charges. The first trial collapsed after an article in a Sunday newspaper. Addressing both Woodgate and Caveney, the trial judge said: "Five young students were caused sheer terror as they were pursued through the streets running for their lives. "By joining in that chase you were terrifying both them and other law-abiding members of the community." But he conceded Woodgate had suffered "agonies" during the trial, and that he bore in mind the "huge financial burden" of the cost to him. Outside the court, the policeman who led the investigation thanked the witnesses in the case for their "great courage". And he said the police's thoughts were with Mr Najeib and his family, who are "still suffering from the after-effects of the events". The court had been told the footballers and their friends were enjoying an evening at the city's Majestyk nightclub on the night of the attack. Mr Najeib had also gone to the nightclub with his brother Shahzad and three friends, all students at Leeds Metropolitan University. When the students left they got involved in a verbal confrontation with one of the footballers' friends, who had just been ejected from the club. Woodgate and Mr Bowyer had left the club at the same time. Moments later Mr Najeib was attacked in nearby Mill Hill and left unconscious in the street. Woodgate, 21, of Middlesbrough, admitted he watched a "big free-for-all" in which a student was seriously injured, but denied being involved in the violence. Mr Bowyer, 24, of Leeds, denied being in Mill Hill and said he did not see the attack and was not involved. "Both men are now free to pursue their careers"
"Woodgate really has some work to do to rebuild his career"
"In light of these verdicts I will be making both players available for selection"